14A Redi-Bath is a highly sensitive water-based magnetic particle liquid with for locating very fine discontinuities in critical parts during fluorescent mag particle inspection. 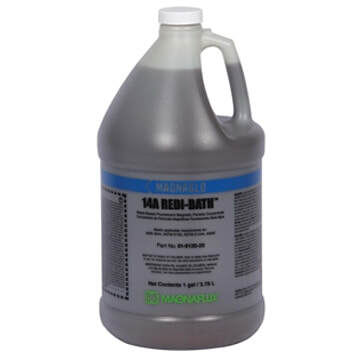 A concentrated liquid with Magnaflux’s best-in-industry 14A magnetic particles with water conditioners and corrosion inhibitors, 14A Redi-Bath is designed to be diluted with water to make magnetic particle water bath. The ultra-sensitive 14A particles provide clear, bright, fluorescent green indications under ultra-violet black light for unbeatable inspection quality and accuracy, with superior corrosion protection. 14A Redi-Bath is an ideal choice for high-volume testing of machined parts, forgings and castings where the mag particle bath needs to be changed out frequently due to drag-in or heavy-use. 14A Redi-Bath meets all major industry and NDT specification requirements, including automotive, API and ASTM standards.